I’ve been thinking about writing this post about learning styles for a while now. It’s an area that I’m sure everyone in the training and learning industry has had contact with at some point. The idea of learning styles has been around for 40 years and I first came across them when completing my training and assessment qualification back in 2007. We discussed visual, auditory and kinaesthetic (VAK) learners and also Kolb’s learning styles. To me it made sense that people would have a preference for the way in which they like receive information. It’s equally logical that if we matched instruction to learning styles, it would result in better learning. How could this be after all this time? I was surprised, so I investigated further. I found that at last count there were over 70, yes 70, different learning styles models. These have been used in schools, higher education, vocational education and the workplace to categorise people as a particular type of learner. The popularity of learning styles shows no signs of slowing down. It seemed that the more I looked for evidence that supports learning styles, the more I found that the research just doesn’t support the theory. On reflection, there was a definite lack of critical thinking on my part. 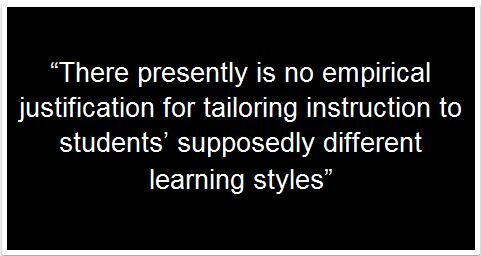 I like Steve Wheeler’s description of the learning styles myth as a convenient untruth. What I also find troubling is that in Australia, the minimum qualification for trainers and assessors and many learning and development professionals is the Certificate IV in Training and Assessment. Units within this qualification still refer to having knowledge of learning styles. This means that subsequent generations of learning practitioners are learning about something that has no evidence to back it up. 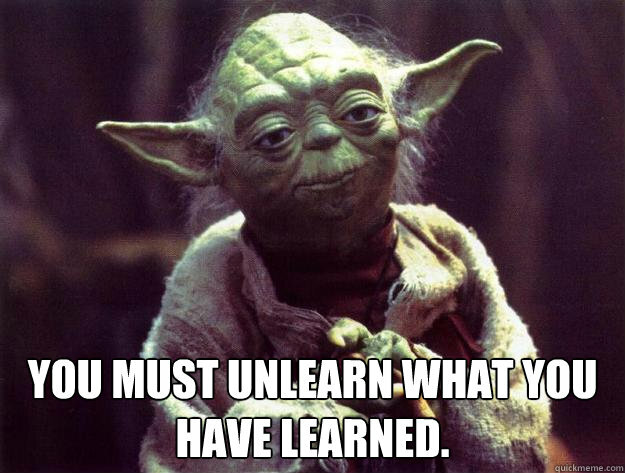 Given that learning styles isn’t helpful, we should as Jane Bozarth wrote, unlearn it. While it may be harder than learning, learning styles is something we need to unlearn. Yes, learners have different characteristics but we need to focus on evidence-based methods of instruction. Take Will Thalheimer’s Decisive Dozen as an example. These 12 factors are based a synthesis of years of research undertaken in learning and instruction. We shouldn’t focus on things that sound logical or are popular or are just accepted. If we want to be taken seriously as learning professionals we need to use theories, methods and techniques that are grounded in research and actually get results. Riener, C & Daniel Willingham, D. (2010): The myth of learning styles. Change: The Magazine of Higher Learning, 42 (5), 32-35. Rohrer, D, and Pashler H. (2012) Learning styles: where’s the evidence. Medical Education, 46. 630-635. Scott, C. (2010) The enduring appeal of ‘learning styles’ Australian Journal of Education, 54 (1), 5-17. Vorhaus, J. (2010) Learning styles in vocational education and training. Vocational Education and Training – Teaching and Learning, 376-382. Motivation has been and continues to be a widely studied area across many of life’s domains. Motivation is the energising force that initiates and sustains behaviour and ultimately produces results. Many motivation theories focus on the amount of motivation, with a larger quantity said to result in improved outcomes. However, as educators we shouldn’t focus on generating more motivation from our learners but instead focus on creating conditions that facilitate the internalisation of motivation from within our learners. Self-determination theory (SDT), an empirical theory of motivation by Edward Deci and Richard Ryan, focuses on the degree in which behaviour is self-motivated and self-determined. According to SDT, engaging in activities for their inherent satisfaction and that are enjoyable are said to be intrinsically motivating. Unlike other motivation theories, extrinsic motivation (engaging in activities that lead to a separable outcome) is not a single construct; it exists in four distinct forms according to the extent to which the motivation for the behaviour emanates from one’s self. In other words, extrinsic motivation can be viewed by the degree to which it is controlling of one’s behaviour (external) or allows one’s behaviour to be more autonomous (internal). Organismic Integration Theory (OIT), a sub-theory of SDT, places the four types of extrinsic motivation along a continuum of relative autonomy, depending on the level of control or autonomy. 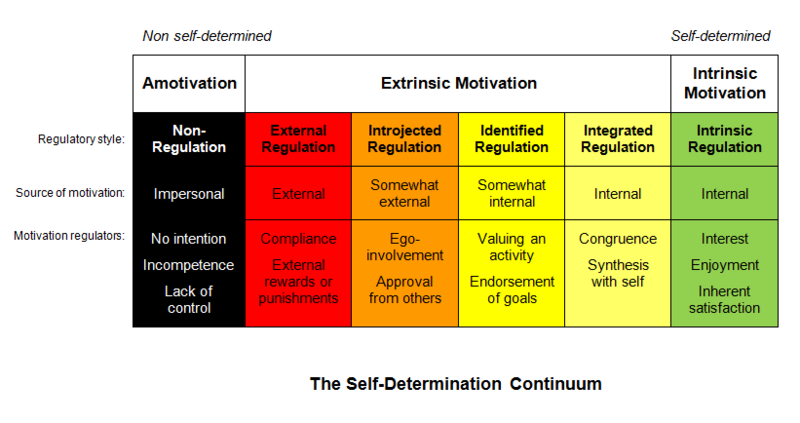 As can be seen in the diagram (from left to right), the types of motivation along the continuum relate to increasing levels of internalisation and autonomy and lower levels of control. Progression along the continuum is not necessarily linear and is subject to contextual factors. However, greater internalisation “is critical for effective psychological and academic functioning at all education levels” (Niemiec and Ryan, 2000, p.138). How can we help learners to internalise their motivation? Contexts that satisfy all three basic needs will help support people’s actions, resulting in more sustained motivation over time and positive outcomes. Learners are not always motivated to complete eLearning modules/courses – it might be a requirement of their job or as part of a qualification. But, if we can use strategies to support their competence, autonomy and relatedness needs we can assist learners to internalise their motivation of these types of externally regulated activities. What do these support strategies look like in practice? Motivation plays an important role during eLearning experiences and our challenge is to create eLearning that our learners want to engage in. As educators, we have an opportunity to assist learners with the internalisation of motivation in the way we design and deliver learning experiences. While it’s not always easy, we need to use strategies that help satisfy the competence, autonomy and relatedness needs of our learners if we want to improve their motivation towards the module or course they are completing. Deci, E. L. & Ryan, R. M. (2008) Facilitating optimal motivation and psychological well-being across life’s domains. Canadian Psychology. 49 (1), 14-23. Niemiec, C. P & Ryan, R. M. (2009). Autonomy, competence and relatedness in the classroom: applying self-determination theory to educational practice. Theory and Research in Education. 7 (2), 133-144. Ryan, R. M. & Deci, E. L. (2000) Intrinsic and extrinsic motivations: classic definitions and new directions. Contemporary Educational Psychology. 25, 54-67. A similar version of this article originally appeared in Training & Development magazine, October 2013 Vol 40 No 5, published by the Australian Institute of Training and Development and eLearn Magazine, October 2013. As an Instructional Designer, motivating learners is an important consideration because in reality learners are not always motivated to learn. They are busy, have other things to do, don’t see the course/session as being important or have had a bad learning experience in the past. I’ve written a couple of posts about motivation – self-determination theory and the motivational pull of video games – which are about satisfying autonomy, competence and relatedness needs of learners. I’ve come across Dr John Keller’s motivational design model known as ARCS and thought it was worth sharing. The ARCS model comprises four major factors that influence the motivation to learn – Attention, Relevance, Confidence and Satisfaction. It’s described as a problem-solving model and helps designers identify and solve specific motivational problems related to the appeal of instruction. The model was developed after a comprehensive review and synthesis of motivation concepts and research studies. Its also been validated in studies across different education levels. Attention = Capturing the interest of learners, stimulating their curiosity to learn. 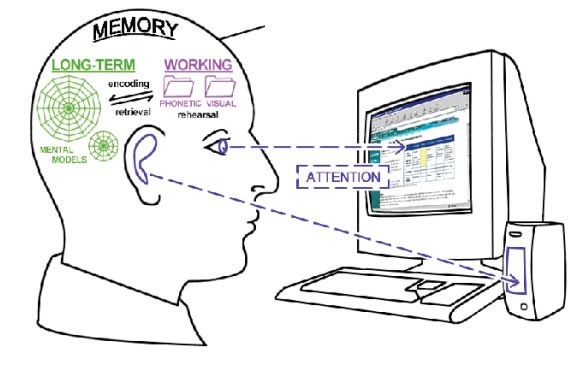 Perceptual Arousal: What can I do to capture their interest? 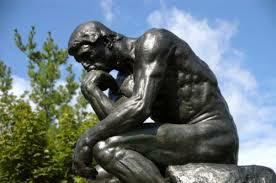 Inquiry Arousal: How can I stimulate an attitude of inquiry? Variability: How can I maintain their attention? Relevance = Meeting the personal needs/goals of the learner to affect a positive attitude. Motive Matching: How and when can I provide my learners with appropriate choices, responsibilities and influences? Familiarity: How can I tie the instruction to the learners’ experience? Confidence = Helping the learners believe/feel that they will succeed and control their success. Learning Requirements: How can I assist in building a positive expectation for success? Success Opportunities: How will the learning experience support or enhance the learners’ beliefs in their competence? Personal Control: How will learners clearly know their success is based upon their efforts and abilities? Satisfaction = Reinforcing accomplishment with rewards (internal and external). Natural Consequences: How can I provide meaningful opportunities for learners to use their newly acquired knowledge/skill? Positive Consequences: What will provide reinforcement to the learners’ successes? Equity: How can I assist the learners in anchoring a positive feeling about their accomplishments? 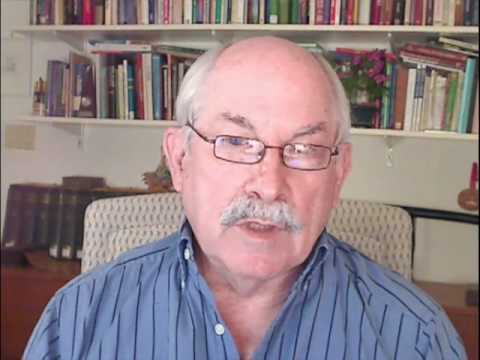 The following link is to a YouTube video where Dr Keller discusses the ARCS Model, some background in its development and the addition of volition to the model. Apart from the motivational aspects of the model, what I really like about ARCS is that it puts the learner at the centre of the design process. After all, that’s how it should be. Keller, J. M. (1987) Strategies for stimulating the motivation to learn. Performance and Instruction. 26 (8), 1-7. “In a fixed mindset people believe their basic abilities, their intelligence, their talents, are just fixed traits. They have a certain amount and that’s that, and then their goal becomes to look smart all the time and never look dumb. In a growth mindset, people understand that their talents and abilities can be developed through effort, good teaching and persistence. They don’t necessarily think everyone’s the same or anyone can be Einstein, but they believe everyone can get smarter if they work at it”. Dweck also says that praising intelligence leads to a fixed mindset whereas praising effort leads to a growth mindset. Your background, upbringing and life experiences all help to shape your current mindset. It’s likely that you’ll have a different mindset in different areas of your life. The good news is that you can change your mindset. It isn’t easy, you need to work at it but it’s worth it. The first step is knowing about the two mindsets and the differences between them. You can see from the above list how limiting a fixed mindset is compared to the growth mindset. The second is making a conscious decision to think in a growth mindset when faced with challenges or setbacks or new situations. You should also use a growth mindset when giving feedback to or interacting with colleagues or staff in the workplace and family and friends in general. Your actions can help to shape the mindset of others. Your mindset can have a powerful effect on your life. So, what mindset are you? Dweck, C. S. (2012). 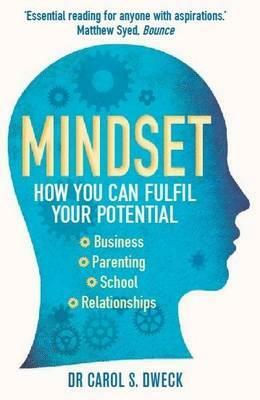 Mindset: How You Can Fulfil Your Potential. Constable & Robinson Limited.